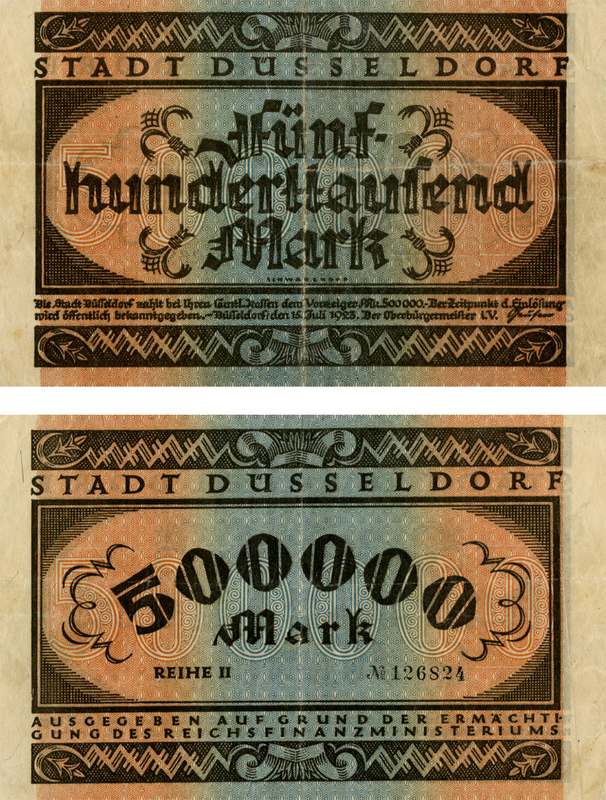 Engraved 500,000 German Mark from the early 1920s. I chose this 500,000 German Mark from the early 1920s. The only imagery on this bill are icons and patterns. There aren’t any illustrations. The closest thing to illustrations would probably be the combination of icons but those still don’t really make up anything meaningful. I think the most prominent icon on the bill is the “crown” located on the top and bottom of both sides of the bill. There are also zig zag patterns on each side of the crown with a sort of floral icon on the edges. The floral icon looks like a single stalk of wheat. The first thought I had when I saw the zigzags is that they looked like a pattern made up of a stylized Schutzstaffel (SS) Nazi symbol. Compared to some other bills we looked at, this bill doesn’t have any illustrations. Some other bills include illustrations of people performing what look like daily tasks or they include something like locations or buildings. Those illustrations seem to represent the community where the bills were circulated. This bill has none of that. I think maybe the lack of illustrations sort of represent a more rigid society like Nazi Germany although Nazism hadn’t taken hold until later. The next pattern I noticed is the crosshatching in the corners of the center rectangle. It’s a basic cross hatch that helps frame the text in the rectangle. Within the rectangle, on both sides, “500,000” makes up part of the background pattern. Inside the digits there is a circle/swirly pattern. Surrounding the 500,000, the background pattern is made up of six-sided starts and pointed ovals. The main colors of this bill are the blue and orange which were used to print the background pattern on both sides of the bill. The two colors are printed as a linear gradient. There is a gradation from orange to blue back to orange. Between the orange and blue there is a green tint that comes from the transition between the blue and orange. From what I can tell the bill has four different typefaces. The typeface that makes up “Stadt Dusseldorf” is a pretty basic serif typeface. The black printed 500,000 is very bold. In each digit there are lines intersecting the sides. “Fünfhunderttausend mark” appears to be a German Gothic script. It is outlined. The “Mark” on the reverse side is the same script but is solid, instead of outlined. It’s interesting to note that the word fünfhunderttausend is one word yet it is hyphenated. Presumably this was done to help with the design. Having the four letters “fünf” and “Mark” above and below the hunderttausend balance the bill out. It would probably look a little wonky if Fünfhunderttausend was squeezed in there on one line.